The library high school book group was created in August of 2007 as a venue for students to have an opportunity to sit and chat about books. The group of 10th - 12th graders meets every Monday at lunch in the library. Bookmarked has also been instrumental in helping the librarian with author visits, fund raising, Teen Read Week and Teen Tech Week. There is always one scheduled virtual visit with an author every year. On December 10th, Bookmarked got to talk to Ashley Elston whose forte is murder mystery. Find more pictures and read more about this visit here. Several members of Bookmarked attended the Louisiana Book Festival in Baton Rouge on November 6th. This annual event hosts many authors who write for young people. This year we got to meet Ashley Poston and Ashley Elston and many others. Author Claudia Gray visited campus on November 27th. Though all the 10th and 11th graders got to hear her presentation, members of Bookmarked got to spend some quality time with her during the book signing. See more pictures from this event. Bookmarked Jr. Edition was added to the library program in the fall of 2016. With three lunches, it was impossible for 8th graders to either join BRiMS or Bookmarked. In 2017-18, the lunch schedule changed again so that the 9th graders had lunch with 8th graders and are now included in Jr. Edition. This group of 8th and 9th graders meets every Thursday at lunch in the library. 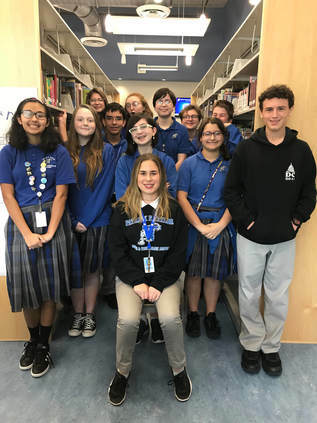 On February 7, 2019, BJE had a chance to visit with the author, Chelsea Sedoti. Her book As You Wish invites so many ethical questions and questions to ask the author. See more pictures from the event on this webpage.